So many brave mamas allow me to share bits of their birth stories and tons of their birth photos in this space on a regular basis. I'm so grateful for their offerings of love to the community of childbearing women who need to hear one another's stories so desperately. Today I offer up my own most recent birth story and birth photographs. May it nourish and encourage you, mamas! I’d been saying all along that I would be “late” with this baby. There were so many loose ends to wrap up, and I could tell she wasn’t huge, and therefore I suspected she’d probably hang out a little past her EDD, packing on a bit more weight. I was cool with it, relieved even. Until the last BIG thing on my “list of things that must be done before I can have a baby” was checked off, just a few days before my EDD. 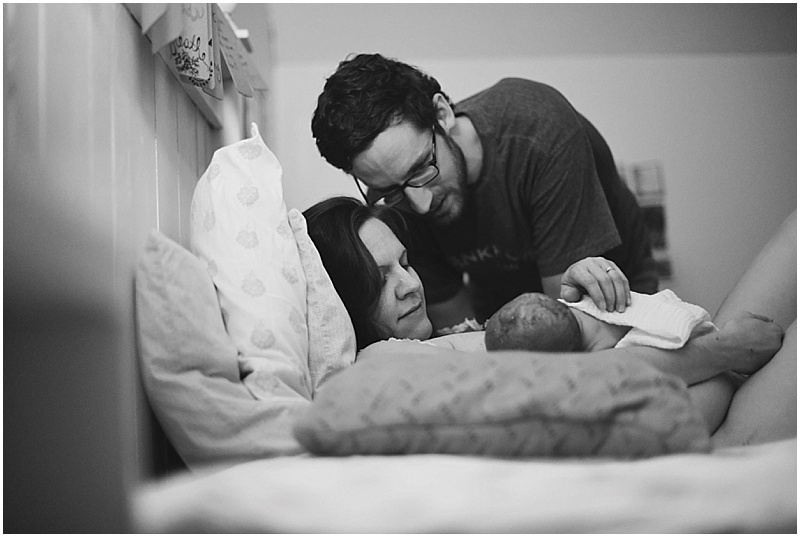 I attended the most beautiful, soulful, gratitude-filled home birth in the middle of a snow storm, present with my whole heart and my cameras to help this amazing mama tell her birth story. I went home happy and satisfied and expecting on some level that I’d immediately go into labor. I did not. So for the next few days I was firmly positioned in that awful in-between space that one almost inevitably falls into when pregnant with a full term baby. The irritability, the suspense, the weariness and the bodily discomfort, the hormonally enhanced emotionality swinging to and fro.. something is about to happen, and soon, but soon is so darn RELATIVE. I spent a day weeping, another day raging, all while trying to keep a schedule inclusive of both rest and activities to look forward to with people I enjoy, activities which might also include labor (going out for greasy food with my SIL, walking the skywalks downtown with two friends from my church family, a date night at home with Tim *wink*). I also engaged in some house-cleaning, both literal and figurative. I dug deep to tend to any emotional, psychological or relational hang-ups that I could clear out of the way. Whether or not doing this work is what ultimately summoned Maeve to be born, I cannot say, but all the same, it was a good cleansing process that set the stage to welcome her. Throughout much of this pregnancy, whenever I’ve tried to imagine what her birth would be like, I kept coming back to this picture of myself, kneeling on the floor, alone at night, and birthing her in complete solitude. An interesting recurrent image, since the actual plan involved a small army of birth workers, most significantly Sara, with whom I’ve done all of my births!, but each cherished and safe people whose presence has a lot of meaning for me, as well as at least two of our kids and a birth photographer. I had a lot of tension around these two contradictory pictures of my birth, and I felt unable to choose one over the other, so I told myself just to watch and see how things unfolded, to make the call about how truly alone I would be only after labor had actually commenced. When one of my midwives said, simply, “this birth will be perfect in every way,” it made me cry when I repeated it aloud. That helped me to let go of control and concern over the details and just trust that whatever it ended up looking like, it would indeed be perfect. God knows. On Friday (Dec 16), the day I had woken up determined to use reverse psychology by telling myself often and with confidence that I wasn’t ever going into labor and that’s just fine because I don’t even want to (so there! ), I was having a pretty good day. My mom took the kids for the morning, so Tim and I got to putz around our quiet light-filled house, doing little nesting tasks, drinking coffee slowly, and switching into a more relaxed mode of being. I even ran out to the public library to pick out a few books to pass the time, and came home with titles such as “I heart my little a-holes,” “after birth (a novel)” and a collection of Anne Lamott’s essays (I find her to be the most pleasant postpartum companion). The kids went off to school for the afternoon, and I took a nap while Walter was napping. My friend Whitney — who is a dairy farmer — texted me with wishes/predictions that my labor may begin that night as a cold front was moving in. She explained that cold fronts seem to bring on labor in their cows, to which I responded, “well then, in this regard, may I be like a cow!” and laughed. After all the kids were back home and/or up from nap at 4:30, Tim went out for a drink with his friend and mentor across town, and had plans to stop to pick up my favorite burger from The Cottage Bar on his way back around 6 pm. While he was gone, the snow started to fall and I started having contractions. But they weren’t bad and I could keep doing all the usual activities. I felt so irritable though. After the kids’ dinner (chicken nuggets and frozen veggies that they didn’t really eat), I lost my cool so badly with Hazel and Gus due to an unfortunate incident with watered down laundry detergent in the wood burning stove and on the living room floor, for which neither would admit responsibility. I found myself acting like my ugliest, raging version of myself and then had to lock myself in the bathroom for a time out until everything could diffuse a bit. More contractions. Tim finally got home at about 6:30 and I was HANGRY. I ate that burger so fast. More contractions. I initiated bedtimes with the kids. Part of my brain knew that this might be the night, so I put each child to bed individually, to make it special, one last one-on-one time with each before their sister would be born, I reasoned and hoped. Walter was down, then Gus, then finally Hazel. And in between Walter and Gus’ bedtime routines, I found bloody mucous on the toilet paper when I went to the bathroom. I told the kids that it meant their sister would be coming soon, probably tonight. By 7:30 they were all in bed, nice and early. I texted Sara (midwife) to tell her I thought I was in real labor, but early labor, and that I’d keep her posted. We wondered if contractions would pick up now that the kids were in bed. I timed them for a bit. They were 30-45 seconds long and 5-6 minutes apart. Nothing to write home about. So I grabbed my Anne Lamott book, went downstairs and paced from one end of our long house to the other, reading he soulful, funny words and gently contracting from time to time. Tim was wrapping up some of his own loose ends at the dining room table, writing important emails, and was largely unaware of what my body was doing. I was still hesitant to “call it” as labor because it was so erratic and not that intense. But at the same time, I could feel more pressure, I could feel my hips widen and my gait change to accommodate that. I had a few contractions that made me draw in my breath more sharply, but I was still walking, still reading. So I went upstairs to sit on the yoga ball and timed contractions for a bit, from 8:35 to 8:50 pm. They were only 30 seconds long (and one minute-long one) and 2-3 minutes apart. Still nothing to write home about, in fact, those are lame early labor numbers right there! But I texted Tim (who was downstairs), “I’m for sure in labor. It’d be good if you could come make up the bed with the plastic sheet and the ‘don’t care if they get bloody’ sheets.” As he did that, I kept chatting with people on Facebook in between contractions, I cleaned the bathtub, I listened to Tim talk about the things he was writing emails about (until I couldn’t focus). The contractions seemed productive, but it also seemed like labor was puttering out, as the surges were so erratic still. I decided to put myself to bed, thinking maybe it had been a false start afterall (as I had had a few of these in the previous week and a half). So I texted Sara and Amy (birth photographer) to tell them that, then Tim left the room and I put on my pajamas and laid down in bed in the dark. This was at about 9:50 pm I think. By 10:02, I was texting Tim to come back, as I could tell things were picking up. So much for going to bed! 10:12 pm I’m texting Sara again — “hmmm. I don’t think sleep is going to be possible. They’re more intense and I can feel her descending. Maybe you should come now”. I texted Amy something similar. Then I laid there on my side, feeling the surges, breathing through them, feeling her move lower and lower… until I couldn’t lay down anymore and I got up on my hands and knees. Tim rubbed some labor blend EOs on my lower back, and massaged my back through the surges. We discussed whether or not to wake the kids to come watch, as they had wanted, but we weren’t sure there was time and we had no one there to tend to them, so we decided to let them sleep. My legs were shaking. My water broke. Still I was personally texting Sara with these developments and updates between contractions. Still I wouldn’t call it pain, just mounting intensity. Yet I knew baby was coming very soon, cos I could feel her moving down. I kept saying affirmations aloud: “These surges aren’t stronger than me, they are me!” and “My baby is coming” and “I can do this.” At a certain moment I knew that I didn’t want to be alone, I wanted Sara! She was en route, but I wasn’t sure she’d make it in time. The next two contractions my body started to involuntarily push, but I didn’t start pushing with it just yet. 10:27 (?) pm, Sara appeared at my bedroom door, put on her gloves, and took her place beside Tim at the end of the bed. Becky (Sara’s senior midwife student) also slipped in very shortly after Sara. Now I began pushing with my body. The baby was moving down fast, squeezing everything out of my bowels along the way, like they were a tube of poop toothpaste (you’re welcome). I could feel her head hit my perineum, then crown. I was aware of every bit, and at one point moaned, “Remind me why I wanted to do this again? !” That was the only point it truly hurt and I was sure I was tearing. Sara announced that she had a compound hand, her arm was crossed over her lower face and that hand resting on the opposite cheek, so Sara reached in and pulled that hand out in front of her head, at which point, the rest of her head was easily born. The surges blurred together with no apparent breaks between, so it was just one long, mighty push — voluntary effort combined with involuntary reflex — before the rest of her was also born (10:32 pm). There was the instant relief of being emptied, of incredible pressure being released… followed nearly immediately by a cry from her tiny lungs, strong and healthy. “My baby! My baby!” I said through emotion, though I couldn’t see her yet. I momentarily rested my head on the pillows in front of me, filled with relief, just taking a moment before turning to meet her. “Did you catch her? !” I asked Tim, and he replied that he had, and that she was so slippery! I awkwardly maneuvered around to face her, with Becky helping me maneuver my leg over the attached cord, and gathered Maeve from Tim’s hands and into my arms and against my chest. She was here at last. We had done it! And then Charis came in, looking joyfully shocked, followed quickly thereafter by Amy, holding a camera and looking full of disbelief that she had missed the grand entrance. For the next hour and a half, I laid back on the bed, holding and nursing Maeve and chatting happily with my birth team. I was surrounded by strong, wise women and a supportive and engaged husband now, in these sweet moments after her birth. We laughed as we pieced together the progression of my labor and the timeline of how I’d communicated with each of them, and exclaimed how crazy it was that it nearly ended up being the unassisted birth I had envisioned. And because Sara has been my midwife with all four of my children, we got to reminisce and compare the births and features of all of them. My placentas have ALWAYS taken about 2 hours to detach. This time was no exception. But we knew this in advance, so we didn’t even do much to try to deliver it until the hour and a half mark, at which point Becky took me to the bathroom to squat on the toilet with a chux pad beneath the seat until it decided to detach. She sat on the floor and talked with me and coached me through the tiny pushes and coughs until at last, there it was. Fully in tact, no excessive bleeding accompanying it, and I was finally done with the birth process. I hobbled back to the bedroom where Tim had been doing skin-to-skin time with Maeve, and hopped back up on the bed to personally do her newborn exam, while Sara and Becky coached me through it! This was a first for me. But since the dream of becoming a midwife was birthed in me during my pregnancy with her, I thought that practicing this little skill set on my very own baby would be a fun little nod to that process of becoming. A few days before her birth, Sara’s mom, Anni, a midwife of 30 years and a mentor to me, had given me and Charis and Becky a little class on doing the newborn exam, so here I got to put it into practice right away. Using my own hands, I intentionally explored her from head to toe, checking sutures and fontenelles, palpating her abdomen, measuring her head (14″ and not at all moulded), chest (14″), belly (13″), and length (20.5″), rotating her hips, running a finger down her spine and looking for placement of eyes and alignment of leg lengths, feeling her reflexes respond to my touches. What a fun and intimate way to get to know my new baby. This was really special for me! And then when it was time to weigh her in the fish scale sling, Tim took the reigns. She weighed in at 8lbs, 2 oz. Becky checked heart tones and respirations. Everything checked out perfectly. And now I see how the two seemingly contradictory visions of her birth that I had had in my heart — one including a huge team and the other of me being all alone — were reconciled in the same story. I had labored alone in body and spirit, and then with only Tim beside me, we came to very brink of birth unassisted… but then just in the final moments, my beloved Sara was with me, and soon after the rest of them trickled in. Their company through those first few hours with Maeve is really precious to me. So, it looks like I got both of my dreams. Before leaving, I was tucked into bed with a placenta smoothie (Becky makes awesome ones! ), a groaning cake muffin (I had baked them in advance), and a bowl of Charis’ homemade ice cream (she makes amazing ice cream). Adrenaline was still coursing through my veins, so it was quite a while before I was able to do anything resembling sleeping, and even then it was the light, hyper-vigilant sleep of a new mama holding her brand new baby across her body. We let the older kids just keep sleeping until morning, but Tim went in to wake them up just a bit before they normally would, so that he could tell them that Maeve arrived in the night and sort of explain why they hadn’t been woken to witness it. Hazel and Walter came in right away, excited as they could possibly be. Gus needed a minute (and some breakfast) before he wanted to come in to meet her. But each one greeted Maeve that still-dark morning with joy and tenderness. Made my mama heart melt into a puddle. All photos by the amazing Amy Carroll.